That’s a familiar face . 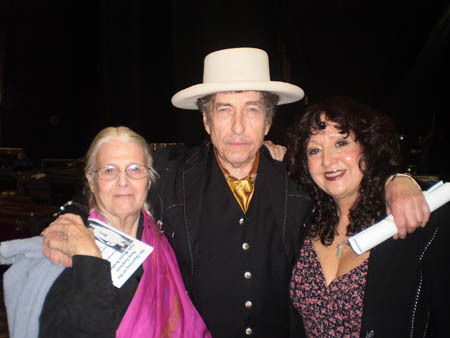 . .
Old friends Betsy Siggins, Bob Dylan, and Maria Muldaur backstage at the Wang Theatre, Boston, Nov. 15, 2009. Betsy is the founder of the New England Folk Music Archives and was a mainstay of the Club 47 in the '60s. Photo courtesy of Siggins Collection, New England Folk Music Archives. in folk music, folksong collecting, and cultural revivals. Club 47, considered the epicenter of the revival, started as a jazz venue and coffeehouse in 1958, but soon joined the folk music boom. 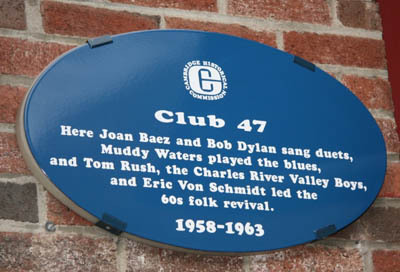 Club 47 launched regional performers such as Joan Baez, the Charles River Valley Boys, Eric von Schmidt, Tom Rush, and the Kweskin Jug Band, who mined many early recordings and song collections. Others like Jackie Washington and Taj Mahal drew on their families’ Puerto Rican, Caribbean, and African-American traditions. Club 47 also introduced audiences to earlier generations of southern roots artists from the 1920s and 1930s such as Maybelle Carter, Mississippi John Hurt, Bill Monroe, and Muddy Waters. During the month of November, the New England Folk Music Archives has partnered with the Harvard Square Business Association and its members to exhibit photographs and memorabilia from the collections in store windows and restaurants around the Square. This Sunday, November 22 at 7 p.m. the Brattle Theatre will have a rare screening of Festival!, one of the essential documentaries of the early Newport folk festivals, with a reception with filmmaker Murray Lerner afterwards. Informative and lovely. Thank you. Is it possible to add the time of Sunday’s screening? I love this, I was such a great fan (still am) of Passim’s — I would go so many Sunday afternoons when I was in highschool. Saw Wendy Waldman, Bonnie Raitt, Steve Goodman, Mary McCaslin and Jim Ringer– oh I am feeling a rush of peppermint tea! I still have my maroon Passim’s tshirt somewhere! The New England Folk Music Archives will prove to be a cultural phenomenon of its own and its contribution to the music scene (past and present) will be immeasurable. Best of luck with this wonderful venture! Thanks for the thoughts and wishes. The New England Folk Music Archives are an independent non profit, unrelated to Passim. Opening a new facility in Porter Square in the next few months, where we will have the space to exhibit rotating photographs relating the the 50s, 60s’ and on generations of folk musicians who have made Cambridge, Boston and New England their creative homes, many permanently. After school programs, public school and library projects and concerts/interviews. The Community support for us is pretty remarkable and we are heartened by it. can’t wait to move to next phase. Great to see Betsy looking so good! I would really like to hear from her….